In my current column for the American Diabetes Association’s Web site I tell more about my medical condition and than most people would be comfortable with saying. My limited concern with privacy is probably obvious to anyone who takes the time to read my online autobiography, particularly part 2, David Mendosa’s Radical Years. I realize that most people have good reason not to divulge their medical condition. I’m lucky that none of the Web sites and magazines that I write for are going to fire me because I have diabetes and less than perfect cholesterol numbers. Diabetes and high cholesterol actually go together a lot more than I imagined before I started to write about the “Heart Profilers” on the Web site of the American Heart Association. For my column I look at the grim heart statistics for people with diabetes. This is something I haven’t done before, because I prefer to be positive. And it is actually the Heart Profilers that give me the upbeat spin that I like to have. Note that the Heart Profilers come to us courtesy of a pharmaceutical company that is gathering information on us. Since I recognize that almost everybody is more concerned with privacy than I am, I am quick to point out that you can opt out of providing that information on yourself. In the previous issue I provided advance word about the new glucose meter from Becton Dickinson & Co. The company subsequently made a formal announcement, providing key details for what they call the Latitude. In the diabetes marketplace BD has focused on manufacturing syringes and lancets. It dominates the quality segment of these markets. Its new meter system builds on its strength in lancets. In fact it uses the new BD 33-gauge lancets, which are the thinnest available. With it a very small drop of blood—only 4µL (0.4 microliters)—will provide a blood sample. The other good news is that it will deliver your results in just 5 seconds, as fast as LifeScan’s One Touch Ultra. The less positive news is that BD does not recommend the Latitude for testing other than on the finger. And the bad news is that the system is still awaiting FDA approval. http://www.bddiabetes.com/ca/english/bdlatitude/see_the_diff.jsp . I have accordingly updated my Meters page at http://www.mendosa.com/meters.htm. I based my first report on the insulin activity of tea in the previous issue of Diabetes Update on summaries and published articles. I had not yet seen the published article. The lead author, Dr. Richard A. Anderson, a research chemist at the USDA-ARS Nutrient Requirements and Functions Laboratory in Beltsville, Maryland, subsequently faxed me a copy of the article, “Tea Enhances Insulin Activity” in the Journal of Agricultural and Food Chemistry. They found that tea from the leaves of the traditional tea plant, Camellia senensis, enhanced insulin activity, whether it was black, green, or oolong and whether it was caffeinated or not. Herbal and commercially prepared iced teas had little enhanced insulin activity. Cream or milk blunted the insulin activity; lemon did not. They couldn’t detect any insulin-enhancing “in the instant teas except for one brand that consistently displayed significant activity.” I asked Dr. Anderson the name of that brand, but he told me that he would rather not say, because they did not do a statistical analysis of all the brands. They studied the effect of at least 10 polyphenol and other tea components, and found that the primary active component was epigallocatechin gallate. This polyphenol increases insulin activity 17.5 times, which they authors call an insulin activity ratio of 17.5. Caffeine alone had no insulin-enhancing activity. I had assumed from the summaries I read that drinking tea would reduce blood sugar. Fortunately, I didn’t write that in my previous report. It’s more complicated than that, as the article makes clear. Just published in August by ICON Health Publications in San Diego, California, this so-called Official Patient’s Sourcebook on Diabetic Neuropathy promises to be of great interest to many of us with diabetes who also have neuropathy, the most common complication. Edited by James N. Parker, M.D., and Philip M. Parker, Ph.D., this 213-page paperback book lists for $28.95. The ISBN is 0597832951 and you can find the publisher’s link to it at http://www.icongrouponline.com/health/Diabetic_Neuropathy.html. The editors, both doctors named Parker, are brothers. The M.D. is an anesthesiologist in San Diego and the medical editor of the "Official Patient’s Sourcebook" series. The Ph.D. is a professor of innovation, business, and society at INSEAD, Fontainebleu, France, and Singapore and associate editor of the series. They call this sourcebook “official” because it “draws from public, academic, government, and peer-reviewed research.” The point, I think, is to differentiate it from books like those by John Senneff, Numb Toes and Aching Soles and Numb Toes and Other Woes. These are excellent books, which I link on my Diabetic Neuropathy page, part 15 of the On-line Diabetes Resources, at http://www.mendosa.com/neuro.htm. But these books and many other neuropathy resources do include remedies that are experimental and controversial. If that was the authors’ intention, they would have had a point. That point, however, is made less sharp than it could be by the inclusion of an appendix on “Researching Alternative Medicine.” This chapter provides links to and names just about every herb and supplement ever suggested for the treatment of diabetic neuropathy. Most people with diabetic neuropathy would be interested in learning about every possible treatment or cure for this often painful condition. But when they turn to something touted as an “official sourcebook,” they have a right to expect the authors to discriminate and describe only those treatments sourced to public, academic, government and peer-reviewed literature. The sourcebook has a quite short list of just three such drugs: myoinositol, aminoguanidine, and aldose reductase inhibitors. But I discussed all three of these and several more almost four years ago in my Diabetes Wellness Letter article, "Drugs for Diabetic Neuropathy: From Treating Pain to Finding a Cure." That article is online at http://www.mendosa.com/neurdrug.htm. About 60 percent of those of us with diabetes also have some form of neuropathy. But 30 to 40 percent of those who have neuropathy don’t have symptoms—yet. Diabetic neuropathy is more common among smokers, people over 4 0, and those who aren’t controlling their blood sugar levels. The first step in treatment is to bring blood sugar under control. While symptoms can initially get worse with better blood sugar control, lower blood sugar levels helps reverse the pain or loss of sensation that neuropathy causes. Some of the best information in the book is about pain relief. It is, however, essentially a rewrite of a part of non-copyrighted government document Diabetic Neuropathies: The Nerve Damage of Diabetes, which it credits. The original says: To relieve pain, burning, tingling, or numbness, the doctor may suggest aspirin, acetaminophen, or nonsteroidal anti-inflammatory drugs (NSAIDs) such as ibuprofen. (People with renal disease should use NSAIDs only under a doctor's supervision.) A topical cream called capsaicin is another option. Tricyclic antidepressant medications such as amitriptyline, imipramine, and nortriptyline, or anticonvulsant medications such as carbamazepine or gabapentin [see “Footnote” below] may relieve pain in some people. Codeine may be prescribed for a short time to relieve severe pain. Also, mexiletine, used to regulate heartbeat, has been effective in treating pain in several clinical trials. Other pain treatments include transcutaneous electronic nerve stimulation (TENS), which uses small amounts of electricity to block pain signals, as well as hypnosis, relaxation training, biofeedback, and acupuncture. Walking regularly or using elastic stockings may also help leg pain. 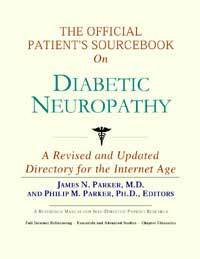 This book is more of a guide showing how to search the Internet for information about diabetic neuropathy than it is a guide to that complication of diabetes. I have used it to improve my search capabilities as a journalist writing about diabetic neuropathy and diabetes. But for most people the book goes too far into searching and the information on diabetic neuropathy itself is relatively thin gruel. The authors of the book reviewed above and of the government’s Web page giving favorable mention to gabapentin may want to revise their words. Gabapentin, they say, is a drug that can relieve the pain that some people with diabetic neuropathy suffer. That may well be true. But it certainly is true that such a use is clearly off-label. Off-label use is not illegal. But fabrications of the safety and effectiveness of gabapentin (Neurontin) would be illegal, and that is what a suit pending against the manufacturer charges. Public Citizen has an excellent review of all but the latest developments at Neurontin (GABAPENTIN)--The Illegal Corporate Creation of a Blockbuster Drug. Melody Petersen’s follow-up article in the October 29 issue of The New York Times says that “Documents Show Effort to Promote Unproven Drug”. Marketing executives for Warner-Lambert, which made Neurontin before Pfizer bought the company, wrote in a May 1997 memo proposing that Neurontin be promoted to treat pain in diabetic patients by creating education classes for doctors and sponsoring a symposium with the American Diabetes Association. The U.S. District Court for the District of Massachusetts court unsealed the memo on October 25 in a case brought by an attorney for a whistle-blower who accuses Warner-Lambert of illegal promoting Neurontin. The United States attorney’s office in Boston is conducting criminal and civil investigations into how Warner-Lambert marketed Neurontin. Joining the case are 47 states, which are pursuing their own criminal and civil investigations. Pfizer Inc., which bought Warner-Lambert in 2002, agreed in May 2004 to pay $430 million fines and pled guilty to charges that Warner-Lambert promoted Neurontin for non-approved uses, in part by plying doctors with favors to get them to talk up the drug. The settlement includes a $240 million criminal fine — the second-largest ever in a health care fraud prosecution. The next edition of Diabetes Forecast—Live! will tell us about “Managing Your Medications Safely.” DiabetesForecast—Live! is a monthly webcast sponsored by the American Diabetes Association and the HealthTalk Diabetes Education Network. You can hear experts discuss strategies for managing your medications safely, side effects and reactions to be aware of, questions to ask your health care team, and why it’s important to follow your prescription. For more information, please visit http://www.diabetesforecastlive.com/edition19/index.html . This is a one-way “broadcast” mailing list that is not set up to accept replies. If you have any questions or wish to unsubscribe, simply write me at mendosa@mendosa.com. If your friends want to receive Diabetes Update, all they have to do is write me here.